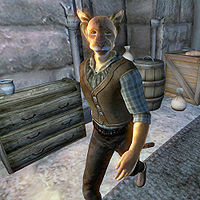 Ra'qanar is a Khajiit monk and servant at Cheydinhal Castle. He is also the only Cheydinhal member of the Thieves Guild, and offers advanced training in Hand to Hand. Ra'qanar knows a leveled list of Monk spells. Even though rumors around town suggests that Ra'qanar is no ordinary servant, he is keeping up appearances without letting anyone know about his involvement with the guild. His quarters are located in the western area of the county hall, and he sleeps there every night between 2am and 8am. He spends all morning and afternoon inside his room, wandering aimlessly around, until he finally leaves the castle at 5pm. He crosses the courtyard and enters the guard barracks where he goes into sneak mode in order to pick up some food. If he manages to either find or steal some, he sits down at the table and eats until 7pm, when he returns to his room. At 9pm, he goes to the Great Hall, where he serves at Count Andel Indarys' formal dinner. When the guests retire at midnight, Ra'qanar stays in the dining area for another two hours before finally going back to his room and bed at 2am. He wears the rare zero-weight plaid shirt along with a pair of blacksmith's pants and thick cowhide shoes. He carries the keys to the Cheydinhal Castle interior and exterior and a leveled amount of gold. When you meet him for the first time, he will play out his humble routine right away: "It is just Ra'qanar, the poor porter. Do you wish to beat me? Punish me? Of course, Ra'qanar deserves your scorn... but pity this one, please." And when asked about Cheydinhal, he will continue: "Ra'qanar is your friend, no? Your servant? Whatever you require? Ra'qanar knows nothing... less, even. But Ra'qanar wishes to please." As an advanced trainer, Ra'qanar can provide you with the necessary reference for the Hand to Hand Master Training quest. Once your Hand to Hand skill level reaches 70, speak to him, and choose the "training" option, which will trigger the quest and this dialogue: "I can't teach you anything more. You'll need to train with the best, and the best I know of is Helvius Cecia. If you can get him to agree to it..." When asked again, he will add: "Talk to Helvius Cecia in Bruma. He's your best bet for learning more about hand to hand combat." "Did you see the fight that Ra'qanar got into the other night?" or "Have you ever seen Ra'qanar get into a fight?" "He's quite an accomplished brawler. I wonder if he'd teach me something about it." or "He's good with his fists, no doubt about it. He'll teach you something, for the right price."